It’s a very dark staging, both literally and thematically. This is, in my experience at least, unusual among L’Orfeos. Most productions are aware of the work’s own teleology–it is conventionally given credit for starting the whole opera thing. 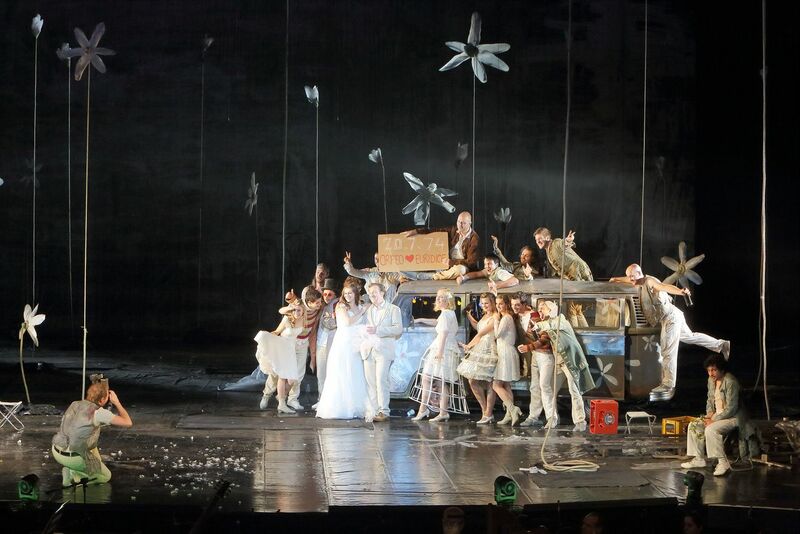 L’Orfeo becomes a work, then, about beginnings, a celebration, a seed for all subsequent operas, while Bösch’s is about endings, death, and the loss of hope. 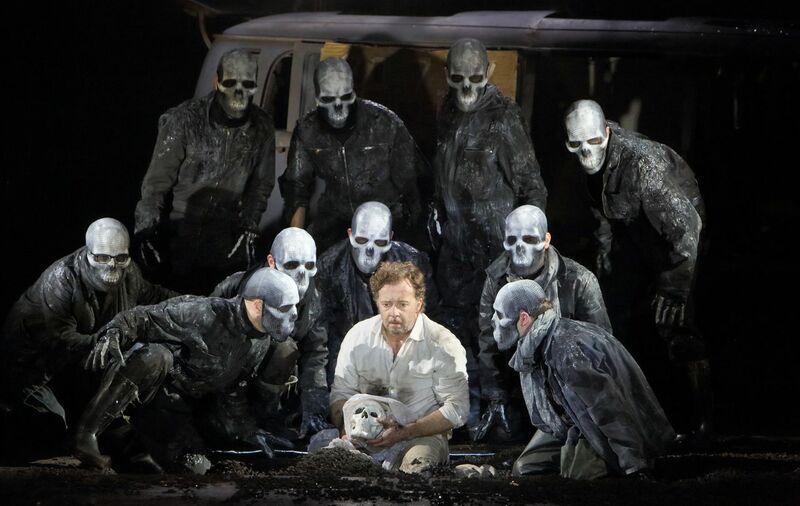 The program’s synopsis describes the Prologue’s Musica as arriving “von den Quellen des Permessos in eine von Zerstörung gezeichnete Gegend gekommen” (“from the source of the Permessus to a place marked by the signs of destruction”) to tell the story of Orfeo. It’s an interpretation, not a translation, but there’s a very thin thread of historical relevance here. That is, opera was created in part for cultural renewal. But that’s not really the argument Bösch is making anyway. Most of the first act and a half are presented as a hippie wedding reception. The more ceremonial moments of the score are the reception’s entertainment. Some of these, like Orfeo’s “Vi ricorda, o bosch’ ombrosi,” are sung into a (decorative) microphone. The chorus is small, only around a dozen–for my musical tastes, this is rather too small–which allows them to function as individuals rather than as an undifferentiated mass. This makes the opera’s opening unusually naturalistic and sympathetic. But once tragedy strikes–and a grave is dug center stage–things turn more fantastic. 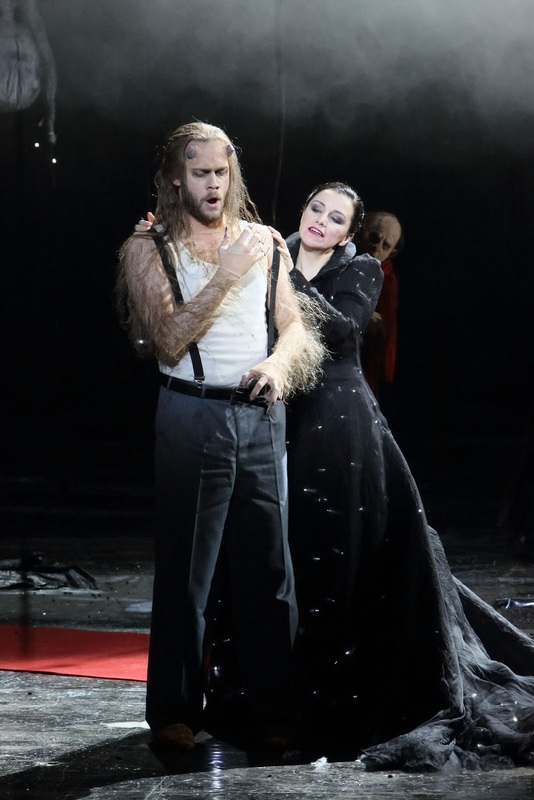 Orfeo descends into the underworld, he encounters spirits without faces, a boat to nowhere, and what has to be one of the more sinister red carpets onstage (leading to Pluto and Proserpina). 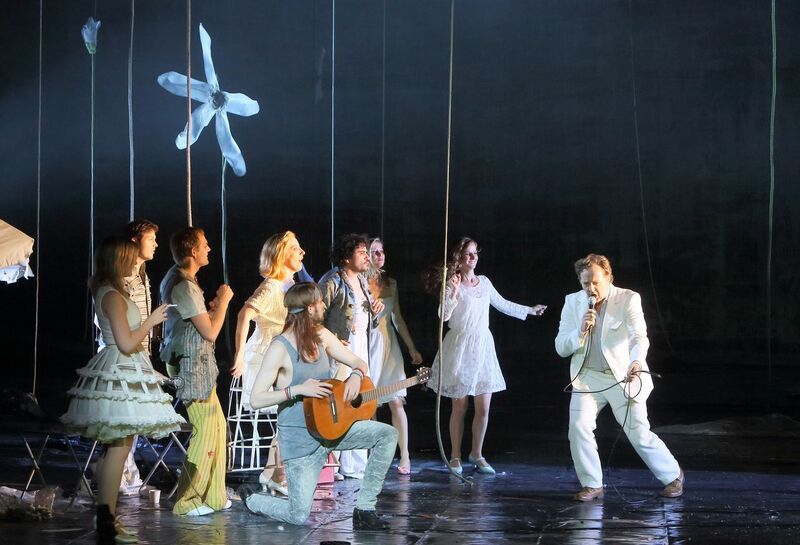 Christian Gerhaher is an introverted Orfeo, his turn towards grief intense but never frantic. He is not, perhaps, a seasoned Monteverdi singer, but he makes the style work on his own terms, carefully coloring and weighing each word and only occasionally singing above a mezzo forte. (Only then does his voice lose its velvety sheen and become somewhat growly.) Legato is lacking, but since the music is mostly what can be broadly called recit, this is alright. While his “Possente spirto” is not virtuosic, he uses the coloratura for great expression. It’s an unpretentious, disarming performance, understated and yet right. But was the voyage to the underworld all a dream? The moment when Orfeo looks back at Euridice is strangely unmarked, here and gone, inevitable only to find Orfeo back home, singing “Questi i campi di Tracia” as he gulps from a flask. 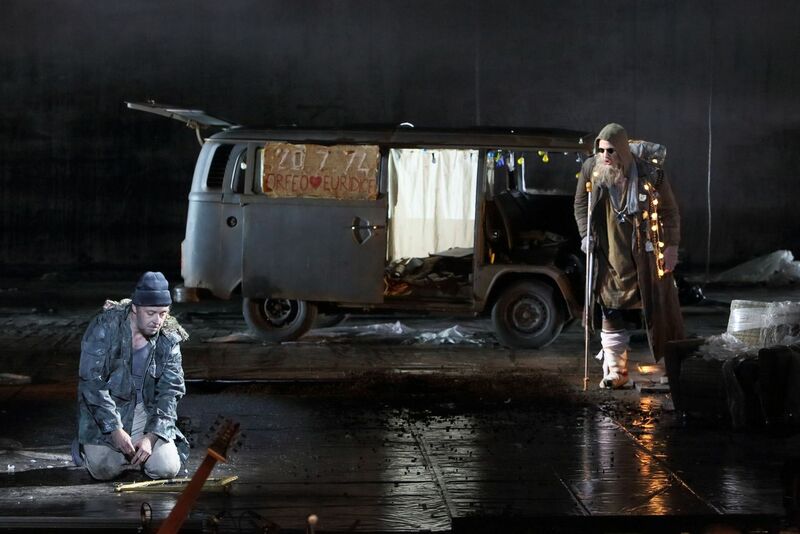 In one of the most bleak endings I can imagine, a hobo Apollo offers Orfeo salvation not as an ascent to heaven but in the form of a knife. 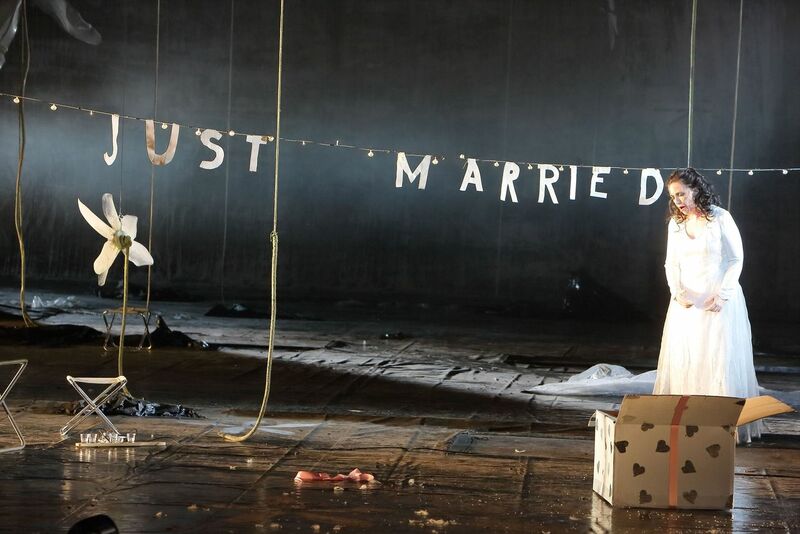 Orfeo stabs himself, and as the chorus sings the happy final chorus, Orfeo’s last happy moments replay as his dying vision–one of the scenes from his wedding. The only trace of hope is that he again crawls into the grave center stage, finally joining the waiting Euridice. La Musica–who is, here, also La Speranza–has failed in her mission. During the Peter Jonas intendancy of the 1990s and early 2000s, the Bayerische Staatsoper developed an unusually fine record of staging Monteverdi and even Cavalli. It’s good to see that current intendant Nikolaus Bachler hasn’t completely forgotten this legacy. They have an ideal space in the small Prinzregententheater, a beautiful Art Deco theater of the Bayreuth model, which is more intimate and offers much better sight lines than the main Nationaltheater. The theater also still has the musical resources to do seventeenth-century opera properly, with the “Monteverdi-Continuo-Ensemble” and members of the usual opera orchestra playing period instruments. This production, originally conducted by Ivor Bolton but here in the revival by Christopher Moulds, includes the full, large orchestra of Monteverdi’s premiere. (Later seventeenth-century operas for commercial theaters, like Poppea, used far smaller orchestras, though today these are often expanded.) The continuo playing is excellent and creatively varied, and the period brass is very fine. The conducting, however, could use stronger contrasts of tempo and attention to harmony–Moulds smooths over some transitions I consider structurally significant. It’s wonderful to see this opera taken seriously as a story and not solely as a historical object. I’ve always thought the score was very beautiful, but this was one of the first times I’ve also found it consistently moving as well. It continues for one more performance tonight. Programming note: due to belated planning, I did not see nearly as much as I would have liked in Munich this summer. I am instead now in Bregenz, with Bayreuth to follow. No Salzburg this year. The hobo offering him a knife at the end of his journey sounds like a veiled reference, somehow, to Der Leiermann. When are you at Bayreuth? I suspect sooner than me; I arrived on August 20. I don't think there's a knife or suicide in Der Leiermann? But the bleak stranger image is a little similar, I guess. I'm in Bayreuth from July 26 to August 2. Ah, we will not overlap; I arrive on Aug. 20.